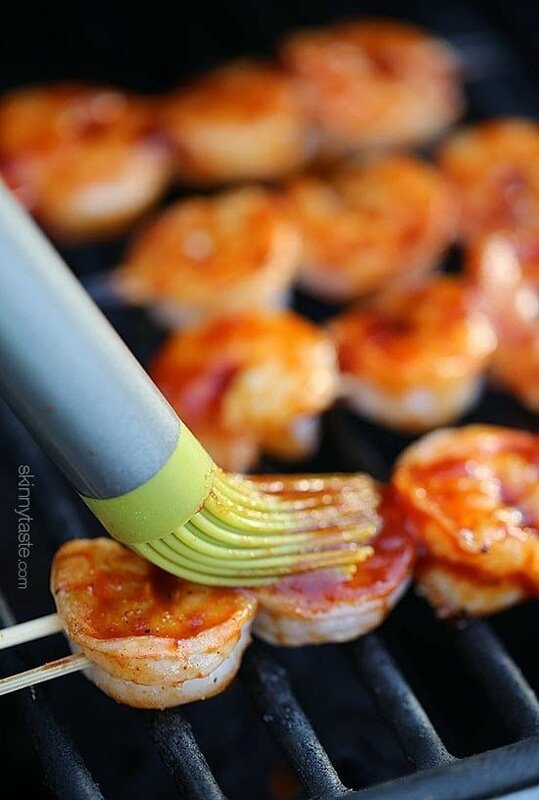 These easy BBQ Shrimp Skewers are slathered with my homemade BBQ sauce, so perfect for any night of the week, or great if you want to feed a crowd – simply double or triple the recipe. 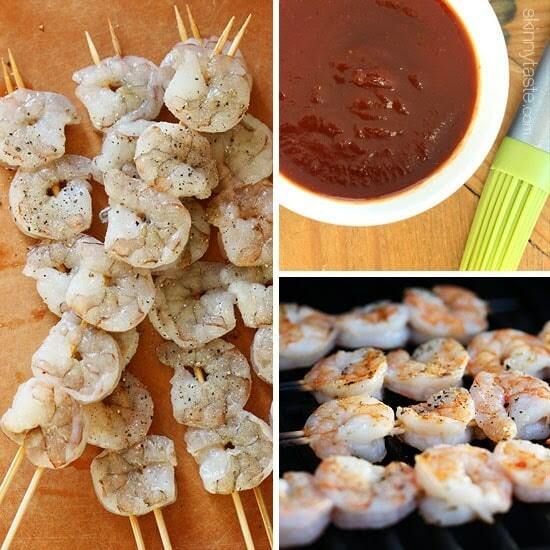 I love making quick and easy shrimp skewers for a lazy summer night. A few of my favorites are Grilled Shrimp Scampi, Grilled Pesto Shrimp Skewers, and Bangin’ Grilled Shrimp Skewers. Every summer I make a my Kansas City Style BBQ Sauce several times to use over chicken, pulled pork, or whatever I feel like grilling. Last week, I used it on shrimp skewers inspired by an appetizer we had while taking a day trip out East. My husband loved it, and insisted I remake it and share it with you here. It was served with guacamole, and he loved the combination, so I recreated it with my guacamole recipe on the side and he LOVED it (calories below are for shrimp skewers only, guacamole is extra). 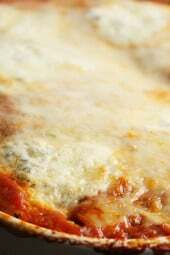 Super easy, and the BBQ sauce makes enough for several recipes. Of course, if you prefer to buy jarred BBQ, that would work fine also. Korean Gochujang-Honey Glazed Shrimp Skewers. Soak the skewers in water at least 20 minutes to prevent them from burning (or use metal skewers to save time). Combine the shrimp with crushed garlic and season with salt and pepper. You can let this marinate for 15 minutes, or even overnight. Heat a clean, lightly oiled grill to medium heat, when the grill is hot add the shrimp, careful not to burn the skewers. Grill on both sides for about 6 – 8 minutes total cooking time or until the shrimp is opaque and cooked through. Brush the sauce on during the last minute of cooking and eat right away. We made this for dinner tonight. It was absolutely delicious! We made the BBQ sauce as well and I am so glad we have leftover sauce to use on other recipes. It is great! Gina, your recipes have helped me maintain my weight loss along with WW for 3 years. Love, love, love your easy, delicious & healthy recipes? Keep it coming. I have shared your website with my WW group! How long would you broil it for? Any barbeque sauce seems to actually work fine since the grilled shrimp alone taste great. Good post. Another Skinnytaste hit for my family…and how nice to have a quick and easy recipe to throw on the grill. Thank you! Looks so delicious. Never would have thought to pair shrimp with BBQ sauce. So quick and impressive, I'll definitely be making this when I have guests over! Alexa…how about the broiler? That might work, just move the rack down. This is a wonderful recipe. I do urge you and all your readers to buy Wild Caught Gulf Shrimp from Alabama or Mississippi or any wild caught shrimp — off the coasts of Texas, Georgia, or Florida, as well. If you research farm raised shrimp, you will understand. Plus, our coasts and our country need for us to do this. Thanks all. I agree! But it's not easy to find up North. 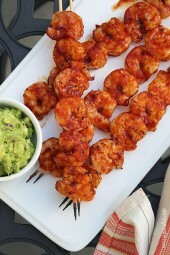 Never had shrimp on the barbie- this looks fabulous! Thank you Gina! 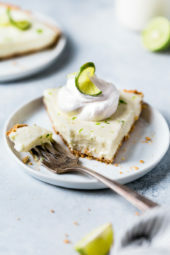 Your recipes are consistently good and I appreciate one that is a bit easier on these 107 degree days we are having here in CA. I am afraid you have spoiled me for all others. I will not even consider a recipe that doesn't have the nutritional breakdown already done for me. I can't wait to try this BBQ sauce on chicken for company I am having over tomorrow night! Wait – 6-8 minutes? 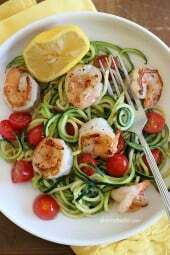 I just made the Grilled Shrimp/Watermelon salad recipe the other night and only grilled the shrimp 1.5 minutes per the recipe – wouldn't 6-8 be overdone?? Laura, it really depends on your grill and flame. I wouldn't go by the time, instead check them when they turn opaque and take them off as soon as they are no longer pink in the center. My flame was a little lower here to avoid burning the sticks, so use your judgement. These look lovely. I always put garlic and chilli on shrimp and never think of bbq, thanks for the idea! Do you have any advice on cooking these delicious-looking skewers on a stove or in an oven? I live in a tiny NYC apartment and don't have a grill :(, but I realllly want to make these!! Looks so yummy. I've done something similar in a skillet, just make sure it's non-stick. I would go light and quick with the BBQ as it smokes a lot! Try a George Foreman grill people Laff at mine but it works great!! Great idea! I forgot how convenient that grill is . Thanks for the reminder . Alexa – I had to improvise one night when my grill ran out of propane at the last minute and I made similar shrimp skewers in my toaster oven (I have a large Breville one) which I know sounds crazy, but they were delicious. I kept basting them with the extra sauce frequently to keep them from getting dry. Turned out really well. I use my grill pan all year, I have a Le Crueset Skinny Grill, it's small and perfect to make this. Gina, I usually love your recipes, but this isn't a recipe! You put BBQ sauce on Shrimp and stuck them on a stick. The BBQ sauce isn't store bought, you actually have to put it together yourself. Not all her recipes have to be too complicated. Sometimes it's nice to have quick ideas like these. Wow! Change your name from Anonymous to ungrateful. I'd love to see all your recipes posted here…keep your snarky comments to yourself or start your own blog. I completely agree that these quick ideas are super useful. If you don't like the recipe, you don't have to make it. I think it sounds yummy…Thanks for ALL your recipes, Gina…the easy and the not so easy ones! Well I for one freaking love this idea and as I just happen to have made your crockpot BBQ for the Fourth and need something simple today, this is perfect and I would have never thought of it. So thank you. Yum! I need these in my rotation! Although I look forward to making your homemade BBQ sauce does anyone have any recommendations for a low pts-store bought BBQ sauce? Weber's – no high fructose corn syrup! Yum! I just got back from KCMO and was just thinking about how I wanted some barbequed something. Shrimp is perfect for this weather.